Welcome to the second edition of Meet Team SnapStream, where we introduce you to the people behind the scenes. Today we're talking to Marlon Dait, QA Tester, who has been at SnapStream for just over 2 years. Marlon: First of all, QA is not question and answer, it's Quality Assurance. Which means making sure that our product can be used by a wide margin of people. People using different operating systems, different browsers, etc. Making sure our product works in any environment. We have to do a lot of back and forth with the developers, testing out their code. If it isn't working the way it should, we have to work with them to remedy that, and if it works we pass it off as fixed. Marlon: This is my first dive into the QA field. Before SnapStream, I worked in a general IT position. I fixed issues on computers or wrote simple macros scripts in Visual Basic. 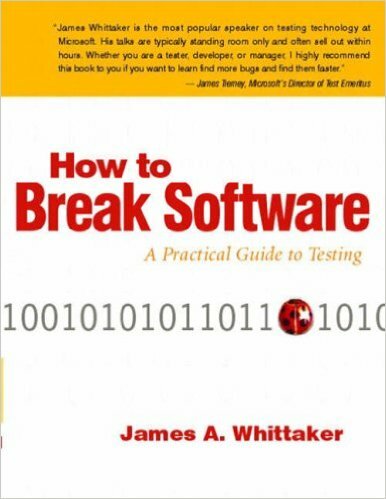 When I first got here, my manager gave me a few books on how to QA and how to QA better. I realized that a lot of the QA work flow is something I identify with, so it was a natural progression to go from IT to QA. A lot of the skills transferred over with ease. 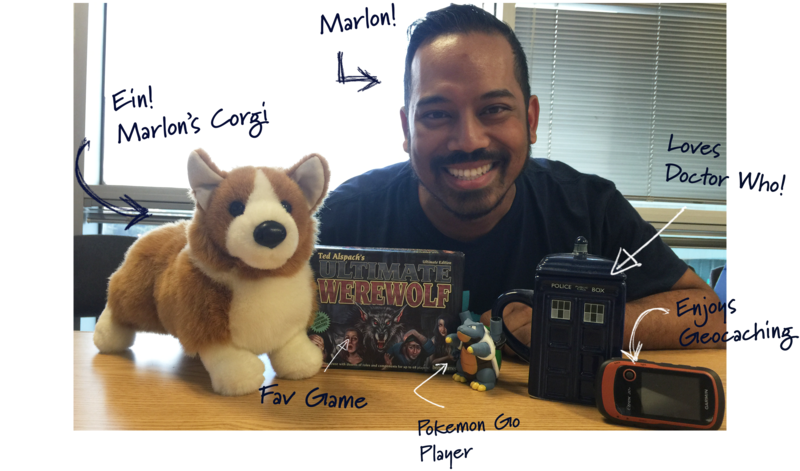 Marlon: Being a QA tester in itself is great, but being a QA tester at SnapStream is amazing. The atmosphere is incredibly relaxed. It's great to have a team around you that knows how to do things and has arcane knowledge of our product's past. The environment is also great because it's a nerd accepting culture. I don't have to hide that I like to go to Renaissance Festival! It's an accepting culture for anything that you want to nerd-out on, from Pokemon to Football. Marlon: So, I actually use our product quite a bit... I think the term is called "eating your own dog food". It's where you use your own product yourself. We test on a lot of the clips we record, so clipping out sections of recordings is something I do a lot. I'll notice a particularly interesting or funny clip, and I like to share it with my friends. For instance, I was testing out MP4 playback to make sure there were no artifacts in the recording, no out of sync issues or skipping. I have to watch the file through to it's entirety, making sure it works, time shifting around, etc. I came across a teaser for a news segment talking about the dangers of flip-flops (there's a lot of flip-flop wearing here at SnapStream). I just had to clip this out and share it with my friends. Clip and share is my favorite SnapStream feature because you grab things instantly, right in the moment and share them immediately. SnapStream hosts monthly, company-sponsored outings. What's your favorite non-work, work function? Marlon: There are so many great things we do. The most recent company outing we had was Painting with a Twist, which was really cool. They gave us wine and food and they had great music! We also had a Top Golf outing, which was fun even though I don't play golf. I just channeled my inner Happy Gilmore. 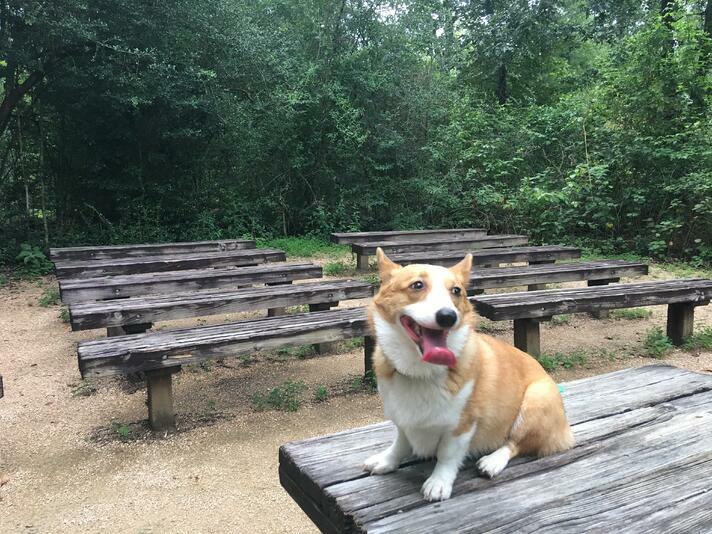 Ein isn't just Marlon's stuffed Corgi... she's a real, live Corgi! My name is Eric and I'm the Customer Success Specialist here at SnapStream. What the heck is a Customer Success Specialist? Great question! It's my job to make sure your experience using the SnapStream software is amazing. I want to help you take full advantage of SnapStream's features to make your job finding, clipping and sharing television content as easy as possible. I've had the opportunity to meet many of you, whether in person or by phone. If we haven't met yet, please consider dropping me a line at eric@snapstream.com or by phone at (713)-554-4591. I'd love to chat with you! We've created some really incredible resources to help you and your team take full advantage of the SnapStream software. I want to take this opportunity to share with you some of my favorites. SnapStream Cheat Sheets are colorful, fun and full of useful information. Keep them on your desk for quick reference on how to use SnapStream's most powerful features. 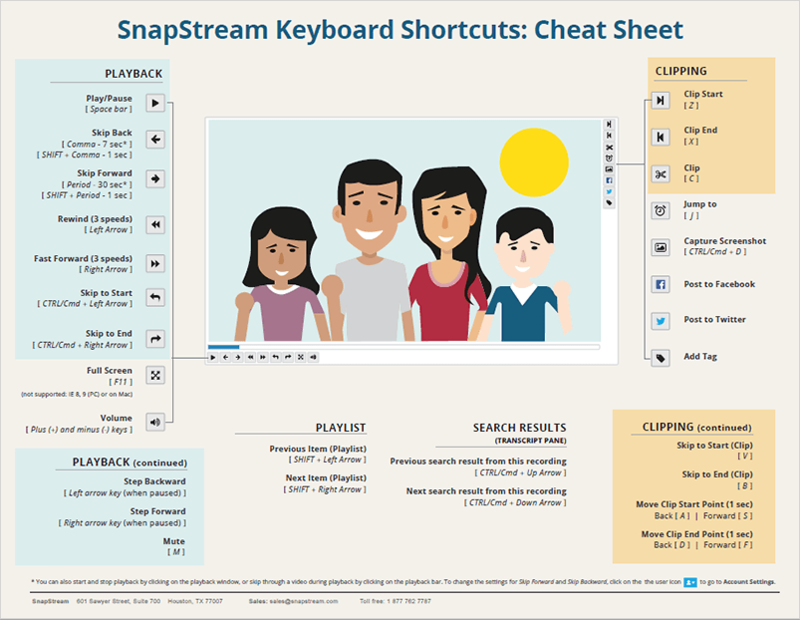 Our newest cheat sheet showing all of SnapStream keyboard shortcuts is below. 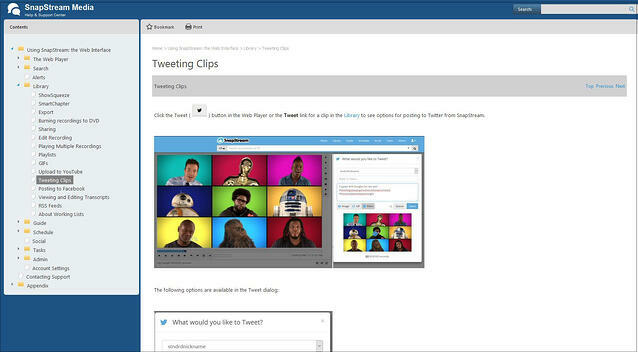 We've created how-to pages for nearly all of the features of the SnapStream software. Our how-tos show you step-by-step instructions for each task with a picture of each step. Learn how to do everything from creating a GIF with meme text to cloud-sharing a clip to a colleague or friend. Click below to see our webplayer clipping how-to! Have a question about a specific feature of the SnapStream software? Odds are very good our SnapStream Help File has the answer you're looking for! Our engineers are always adding new features to SnapStream. Get a look at all of the newest features on the SnapStream Release Notes page. Did you know we recently added full iPad playback support for H.264 content in SnapStream, for instance? Click the image below to see all the great features added with each new release of the SnapStream software. Still have a question? Don't hesitate to reach out to me at eric@snapstream.com. I can't wait to see all of the awesome ways you use SnapStream. What are you waiting for? Snap to it!